These super easy stuffed beetroot are a delicious treat that are great as a snack, side dish or starter. Scrub the beetroot clean, add small pricks with a knife and cook in microwave (covered) until tender. Allow to cool and scoop out the inside of the beetroot with a teaspoon. Mix together goat’s curd, toasted walnuts and fresh thyme leave and season with salt and pepper. Fill beetroot cases with the goat’s cheese mix and place in oven at about 180 degrees until the beetroot has slightly roasted and the cheese is golden brown on top. Remove from the oven, drizzle with olive oil and extra thyme leaves and serve. ELE tip- make sure you keep an eye on the beetroot in the microwave! Looks so delicious. Do I dare try? I think I might. That is definitely a ‘must make’ the colours are so vibrant and I just love the ingredients, it sounds like a delicious and special dish. Thank you also for visiting my blog. Thanks for visiting ELE too! I love the combination of flavours, can’t wait to try! Although I’m echoing everyone else, the colors of this dish are fantastic. I’m not a fan of beets, but I really want to try this. Hi Tricia, thanks for visiting ELE! The beet flavour is quite subtle once they are hollowed out- definitely give it a try, they are so tasty. No goat curds here. Perhaps cream cheese? 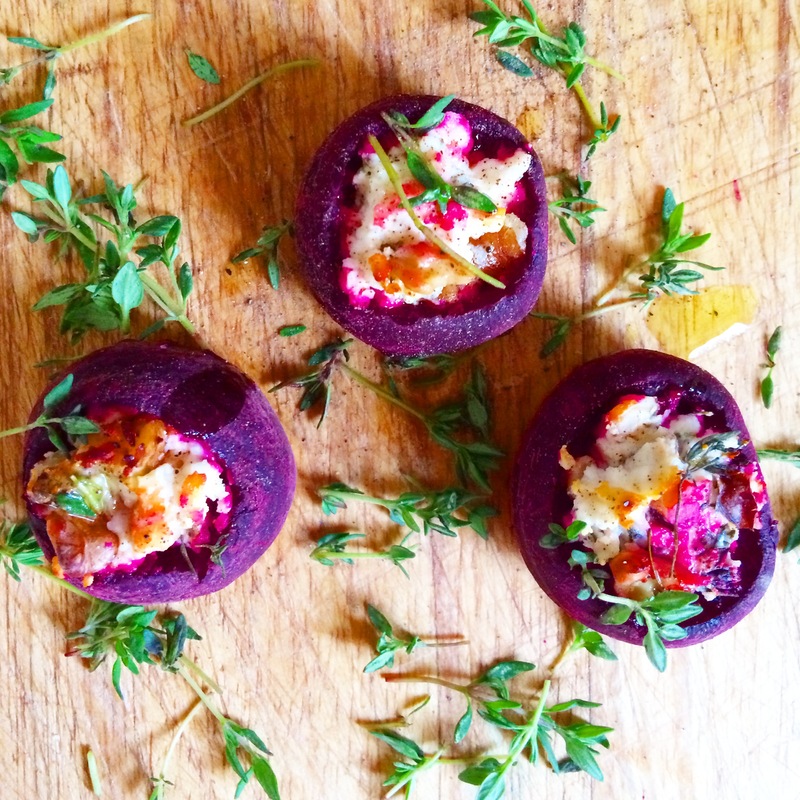 Love this idea because I am in love with Beets – I’m curious what you do with the inner part of the beets that you scooped out. Usually when I scoop out the center of something I’m stuffing, I incorporate that inner part in the stuffing itself! Lovely! Look forward to the brownie recipe. Reblogged this on Bisley Allotments. YUM! that looks so gorgeous I just wanna eat it right NOW! I love the way these look! I feel I inspired you, lol, and I will try these myself. Mint and beets, sounds delicious! What a gorgeous sounding recipe! I can’t wait to try it! I love the taste of roasted beetroot, goats cheese and walnuts together but I never thought of combing them in the same parcel – brilliant! They are so good Sonia- hope you love them! What a gorgeous dish!!! I am eating pickled beet root while reading this and I am now wishing mine was roasted with goat cheese instead!!!! Beautiful picture! I love the plating and it sounds delicious…can’t wait to try. Thanks for taking the time to visit my blog. I’ll certainly be back to yours. Oh my goodness this looks nothing short of incredible! Wow, these are as pretty as a picture. And the look so simple – will be trying these out on my guests this weekend.